This issue's article is by John van der Does who is sixty-eight years old. In the late 1960s he was in the Army and served in Vietnam. He has become quite antiwar since that time. He has lived in France and has studied French in 1970s at the Université de Besancon. In the 1990s he worked at the Strand Bookstore, a large secondhand bookstore in New York City. John is a certified yoga teacher who currently teaches a modified version of Ashtanga yoga. He is also working on a novel and lives with his wife and cat in rural Vermont. My interest in Vedic Math goes back a ways. I was studying Sanskrit and practicing as well as teaching yoga in New York City back in the 1990s. One day wandering into the East West Bookshop in lower Manhattan I came across a book on Vedic Math. That book could have been Vedic Mathematics by Sri Bharati Krishna Tirthaji; I'm not sure. I recall flipping through it and placing it back on the shelf. Vedic Mathematics, however, must have rested in my memory. I did not have the vaguest idea about it except it appeared to be an ancient and, as well, a new approach to mathematics. Then about three years ago out of sheer curiosity I googled "Vedic Math" on the Internet and consequently began to buy books and DVDs on the subject. I slowly began learning how to works, but still have many questions. Going way back to my early schooling, which now seems like a bad dream, in the eighth grade I was terrified and did poorly in all subjects especially in both reading and mathematics. I recall being put in the back of the class with magazines to look at. That was way back in the late 1950s. During one math test, my hands were perspiring so much, and then the bell rang for the next class and I handed in a wet paper with nothing on it. I like what you say "On the Sutras" describing the Sutras as particular types of mental functions which appears in the Appendix to Discover Vedic Mathematics. It seems to me that the way Vedic Math works keeps more in tune with how the minds actually works than going through the drudgery of learning times tables by heart. Anyway, I believe Vedic Math could be a more integrated and simpler way of learning maths for children. That's one thing that's occurred to me. I've given thought to teaching it, but that would mean going back to school which I'm not willing to do at this juncture. I still find Sri Bharati Krsna Tirthaji's book, Vedic Mathematics, difficult. And so, I have been reading around it by skimming other people's works on Vedic Math. "On the Flag" division was difficult at first, and it took the longest time for me to fully understand. About a month ago I suggested to the person who owns the yoga facility where I have a yoga class that I do a lecture on Vedic Math. He has an engineering background and when I explained it to him, he became enthusiastic. I made the effort to put up posters at cafés and high schools. The lecture turned out well. About eleven people showed up which was more than I expected. 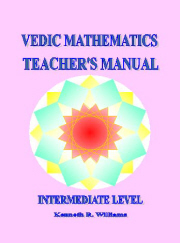 Many were overwhelmed by the simplicity of Vedic Mathematics. Three people in the audience were local math teachers and one person had done graduate work in mathematics. First, a gave a synopsis of the life of Sri Bharati Krishna Tirthaji. Briefly, some of the topics were Vertically and Crosswise (multiplying a two digit number by a two digit number, and also, multiplying a three digit number by a three digit number). Next was bar numbers which for some in the audience was hard to grasp. Then came Ekadikena Purvena (one more than the previous). I started with 35x35 and engaged the audience with other examples. That led up to 26x24, 47x47, etc. I described the usefulness of "All from Nine and the Last from 10" and worked with numbers near a base (10, 100, 1000, 10,000), e.g., 89x97, 108x107, 105x97, 89 squared. Next, Proportionately, 66x15, double 15 and half 66, several examples, and Transpose and Apply (61x5, multiply by 10 and half), several examples. I talked about pi 3.14159... and the fact the ancient Hindus may have chanted mathematical formulae and sutras which is actually how Sanskrit grammar is traditionally learned. Chants stick in the mind and are easily memorized. I gave the example of go pi bha ya ma du vra ta. I did the special division by 9, the flag method, cubes (32 cubed, double the two middle figures and add). Cube roots, using by Mere Observation, got an astonished response. Finally, getting toward the end, I showed the absurdity of changing the fraction 1/19 and 1/7 into a decimal using conventional division. That's about it. The lecture lasted for two hours from 7 PM to 9 PM with a five minute break halfway. The next day I met a young woman who had been in the audience approached me saying the lecture was fantastic and wanted to know when I was going to give another one. Last week, I did a presentation (4 1/2 hours) for a group in south Florida. The parents liked it and the kids loved in even more. I could not have asked for a better session. During the week following the class, I was contacted by several of the parents who requested a follow-up class. That class is being organized as we speak. The gentleman who organized the class and who took the risk of having me come down to present was so taken by my "performance" that he also wants to have me back for another class. This first group presentation could not have gone better. Vedic Vidyalay http:\\vedicvidyalay.org , a not-for-profit volunteer organization based in Somerset,New Jersey, USA is starting Vedic Mathematics classes. The classes will run 6-8 pm on every Friday, September through June. Our aim is to popularize Vedic Mathematics. For further detail please contact us at 732 305 0509. Our website, www.vedicmaths.org was recently featured in a ClickSchooling review for providing a terrific online resource that engages students in learning. "Words really don't begin to describe this innovative way to solve math problems and mentally calculate answers to math equations." We are developing an interactive site on vedic maths. The site can take any operations and find the fastest way to calculate it and then dynamically animate it and show it as a demo for the user. The site is under development and only a technical prototype is uploaded. Please let us know your views on the concepts. We have currently only enabled a couple of formula as of now. Any suggestion, feedback are welcomed. Please feel free to get in touch with us at . Rajeshwari Mani Sharma is a long-standing and inspiring teacher of Vedic Mathematics who has been developing courses. Here she gives a neat development of the Ekadhikena method of multiplying numbers. Ekadhikena Rule is applied when we multiply numbers like 33x37, 51x 59, etc. This doubt came to me. What if the units add to 10 and the 'tens' place has different numbers? Will 'Ekadhikena' rule still work? Well I thought and worked out the logic as follows. Let us start with two digit numbers. Consider 40 as the base number. Left side is 4 multiplied by 6 (which is one more than 5, the other number in the tens place). Right hand part is 2 x 18 = 36. Hence the answer is 2436. Ekadhikena is still at work here but hidden. Consider 3 digit numbers where the hundred's place are different and the remaining digits add to 100. Here also the 'Ekadhikena' rule is working. If we round off the smaller of the two numbers to the nearest 10 or 100, we can still apply the rule. Only in this case it would be 'one more than the bigger digit '. "The principle also applies when the two digits in the first number are the same and the two digits in the second number add up to 10. But in the second step, the 1 must always be added to the first digit of the multiplier."